Sculpture Size: 10.75 X 6 X 9.5 in. Bill was horribly bored at work. His only escape was reading novels about the sea and pirates. His heroes were Sandokan, Blackbeard, Jack Sparrow and Popeye. 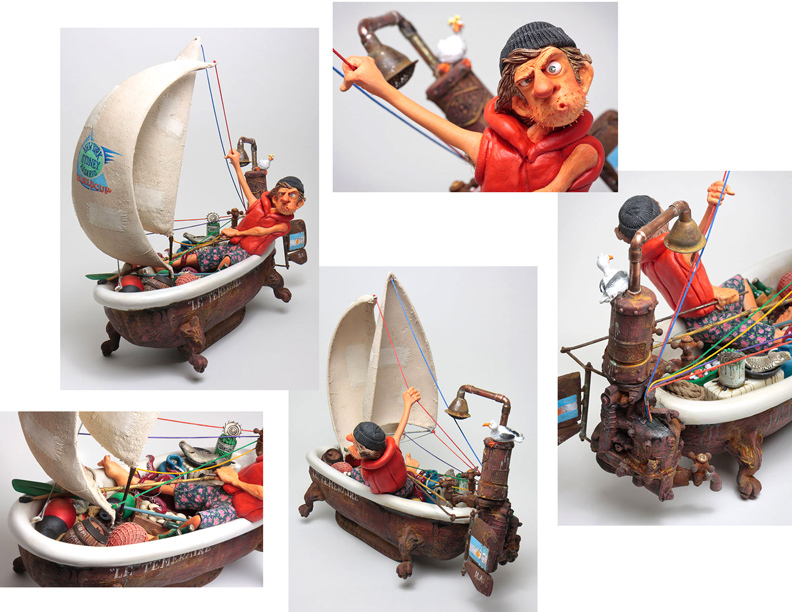 One day he decided to build an extraordinary sailboat from an old bathtub, rusted pipes and old sheets. To the cry of “Ship Ahoy!” he took the sea for a trip around the world and his dream to become a corsair became reality. It took only 5 minutes for his superb sailing vessel to sink, but Bill, far from being discouraged, refloated the boat and to the cry “Hoist the Colors” again launched himself to conquer the oceans.